I lived it so well that I now have one mother of a head-cold that only responds to hot tea with lemon, honey and Rock n’Rye. I’m not sure it’s actually responding, but it’s putting me in a better mood, which will come in handy tomorrow when I have to pay the bills for all this living I’ve done. My cousins, Andrea and Carlo getting the hang of crab legs. I enjoyed every bite of crab and shrimp drenched in Lemon-Butter-Garlic Sauce, even the drips on my chin. I relished seeing my fourteen Italian relatives, who came for my nephew’s wedding, finally getting the hang of cracking open giant king crab legs, and diving in with gusto. I loved the fact that the celebration was in my brother’s basement, just like it was in my parents’ basement for 57 years. My dad and his infamous eels. I love the attractive construction lighting hanging on the stairs and St. Anthony hiding right behind my dad’s head. My mom was from Naples, where the Feast of the Seven Fishes or La Vigilia originated. The church rule was that “good” Catholics should abstain from meat (and pretty much anything else that’s fun). 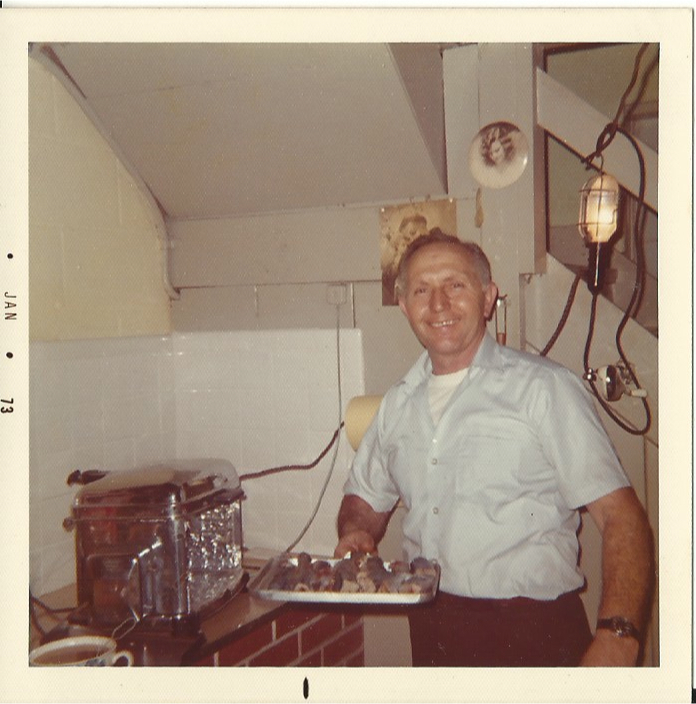 She and Dad started the tradition before I was born, always cooking fish on Christmas Eve. They cooked smelts, squid, pasta with octopus, eel, cod and shrimp. My father was in charge of the eels, which were iffy, at best. The octopus was great for scaring neighborhood friends. I’d reach a fork into the pot, pull out a tentacle covered chunk and show it to my neighbor, Kathy Pfleghar, who recoiled in horror. 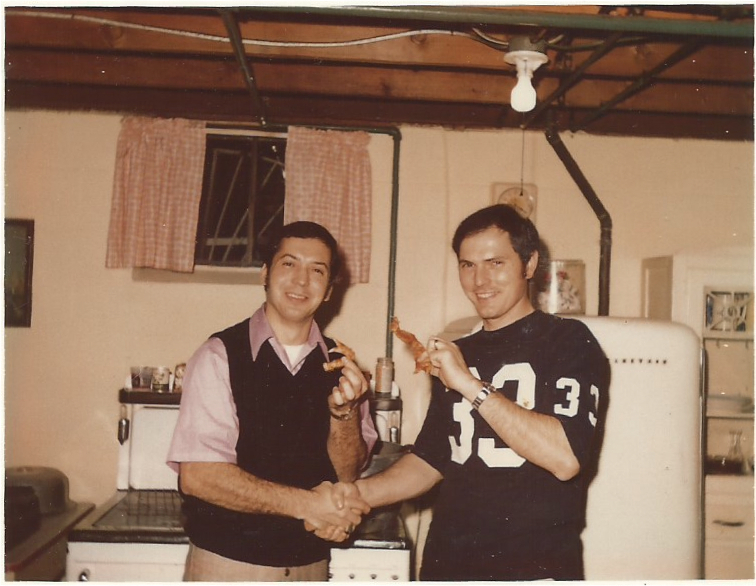 I wasn’t a fan of our dinners then, but they improved drastically in the mid ’60s. 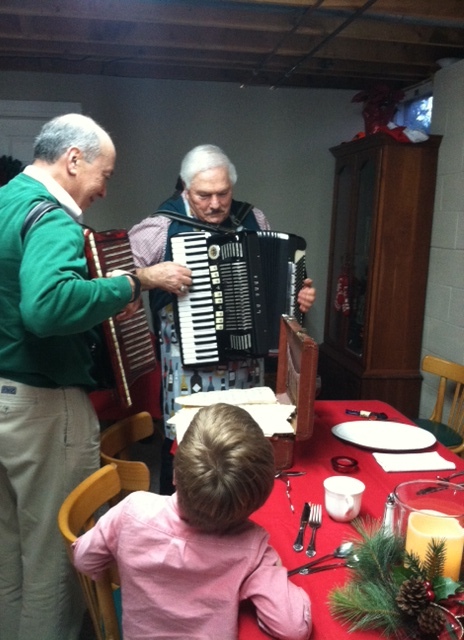 Bernie and Bob playing Christmas Eve favorites with my great-nephew, Nate watching in wonder. Sometimes I think about Bernie’s decision to come home that Christmas Eve and the affect it had on our family. If he’d decided to hang out with his friends instead, years of wonderful memories might never have happened. I’m so glad he chose us. My living caused me to notice a third Christmas miracle. My Carpatho-Russian, and Polish sisters-in-law have morphed into blonde matriarchs, who serve a meal as well, or better, than any Italian I know. (This actually happened many years ago, but this year I was there to see them in the preparation stages and it was impressive.) They knocked themselves out to make sure their homes were gorgeous, dinner was delicious and there was enough food to feed at least two small countries. My mother and father’s souls are undoubtedly bursting with pride. 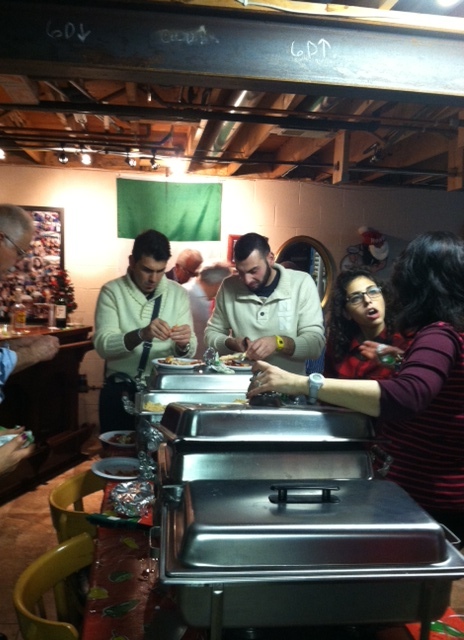 As for the 14 extended Italian family members who were here, we were all completely blown away by them. 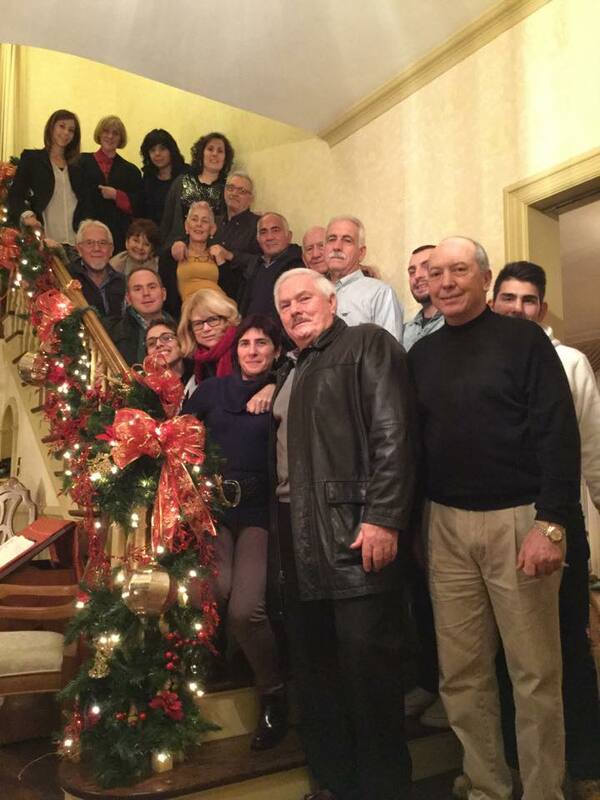 How often can you get that many family members together and not just love them because they’re your relatives, but actually like each one of them? I tell you, Christmas miracles abounded this year. I’m glad I took the time to notice. Place olive oil and garlic in pan and sautè for about three minutes over low heat. Break cooked crab into pieces and toss with olive oil, garlic mixture. Add the 8oz. glass of red wine. Let the crab, oil, garlic and wine mixture cook for about 10 minutes. 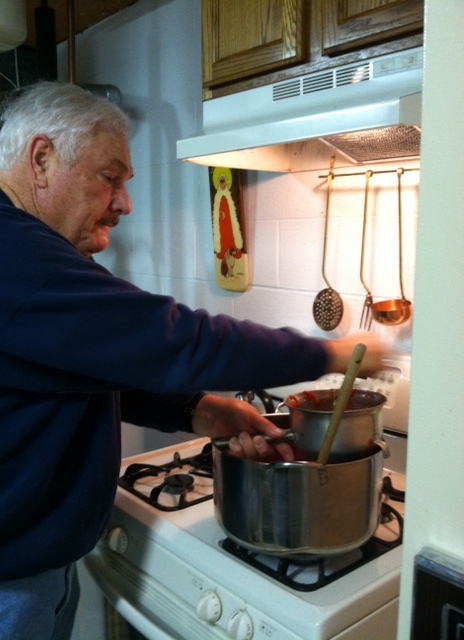 Bernie running the crushed tomatoes through the mill. 1 Tbsp. crushed dried porcini mushrooms. Cook on stovetop over low heat for 3 hours, stirring to make sure it doesn’t stick, or cook covered in oven for 5 hours at 185 degrees. 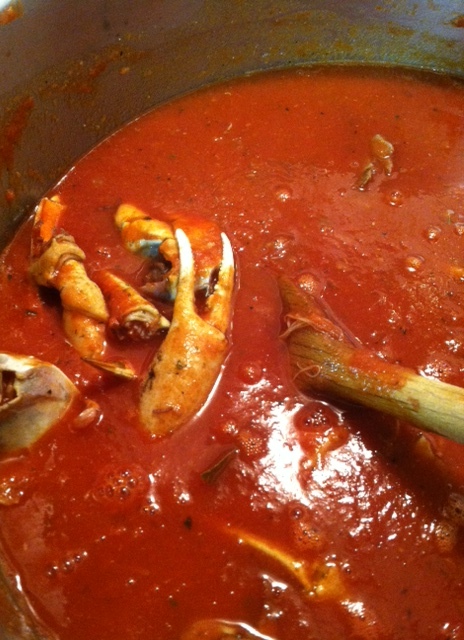 When sauce is cooked, remove some crab from the shells and put it in the sauce. Reserve a few claws for photo opportunities and pinching each other’s noses. This entry was posted in Italian wisdom, Random Thoughts and tagged Christmas, crab pasta sauce, Feast of the Seven Fishes, Italian customs, Italian humor, Traditions. Bookmark the permalink. i’m way behind on your posts, but loving them (as always). Yay for Christmas miracles, and wonderful food! Love you for reading them Matilda! Happy New Year! Oh, Fran… I LOVE this post. So glad you were “home” with the kids to experience a Christmas miracle and remember Christmases past. Here’s to a year of miracles. Thank you Linda, it really was absolutely one of my most memorable Christmases. I know my Dad would have been thrilled. Thanks Bern, couldn’t have written it without you and the rest of my fab family. Great picture of Dad. That’s the way I want to remember him. Yeah, I love that one! Thanks for reading and taking the time to comment. Thank you Nicol, you are the best. Gramma Zanzarella would be happy, we’re all drinking hot toddies! Have a happy, healthy, prosperous 2015! I’m aghast. I was with him and wrote exactly what he said. Man, these chefs are always changing their minds! Glad you enjoyed it. Thanks for writing Mary. I think everyone feels the same. Cool and yes, I have to say, it was one of the nicest Christmases I’ve (we’ve) experienced in a while. Excellent job by both brothers & their families! There was a language barrier for me but through some words & phrases I could understand and just experiencing personalities & expressions, the individual personalities came through and there was an understanding that you just “got.” Happy New Year to everyone! !